Yesterday, colleague Ed Oswald gave four very good reasons why Target is dumping Amazon ereaders and tablets. For Kindle Fire, perhaps there is another: It's not selling. Today, IDC reports that Amazon tablet shipments collapsed during first quarter, all while iPad lapped them up. "Apple reasserted its dominance in the market this quarter, driving huge shipment totals at a time when all but a few Android vendors saw their numbers drop precipitously after posting big gains during the holiday buying season" said Tom Mainelli, IDC research director. Apple's media tablet share rose to 68 percent from 54.7 percent during fourth quarter. Kindle Fire's shipments collapsed -- from 4.7 million to around 700,000 quarter on quarter. Amazon's share dropped from 16.8 percent to 4 percent, placing it third to Samsung. The dramatic change undercuts one of the major tenants of my weekend post: "Google has lost control of Android". Amazon's success, with customized, curated Android and supporting app store, hurts the entire ecosystem, because Kindle Fire accounts for more than half of market share. But Amazon is only a threat if Kindle Fire succeeds, and first quarter set it back, which is good for all Android licensees and Google. According to IDC, Kindle Fire and iPad accounted for 71.5 percent of all tablet shipments during fourth quarter. Strangely, the number was higher during Q1, 72 percent, but dramatically different. iPad share gains almost entirely came from Kindle Fire -- the one adding 13.3 points and the other falling 12.8 points. "Apple's move to position the iPad as an all-purpose tablet, instead of just a content consumption device, is resonating with consumers as well as educational and commercial buyers", Mainelli says. "And its decision to keep a lower-priced iPad 2 in the market after it launched the new iPad in March seems to be paying off as well". Apple also benefitted from new iPad's high-resolution display, a distinguishing characteristic from all available competing tablets. 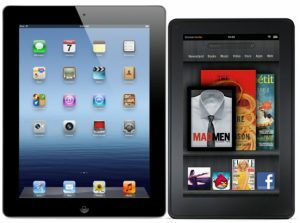 Kindle Fire's appealing price, $199, couldn't compete with Apple's one-two punch -- the other being $399 iPad 2. Lenovo moved into fourth place during the quarter, as Samsung solidified a recaptured second. Barnes & Noble rounded out the top-five. Lower pricing distinguishes iPad's Android competitors. "It seems some of the mainstream Android vendors are finally beginning to grasp a fact that Amazon, B&N, and Pandigital figured out early on: Namely, to compete in the media tablet market with Apple, they must offer their products at notably lower price points", Mainelli says. "We expect a new, larger-screened device from Amazon at a typically aggressive price point, and Google will enter the market with an inexpensive, co-branded ASUS tablet designed to compete directly on price with Amazon's Kindle Fire", he emphasizes. "The search giant's new tablet will run a pure version of Android, whereas the Fire runs Amazon's own forked version of the OS that cuts Google out of the picture". As I've repeatedly expressed, a Nexus tablet is more about Amazon than Apple, and realigning the Android ecosystem. Still, the overall tablet market is volatile, as Kindle Fire demonstrates and something else: Overal shipments declined 38.4 percent quarter on quarter -- to 17.4 million units from 28 million. That's 1.2 million devices below IDC's forecast. Looking ahead, Windows 8 tablets are expected to debut during fourth quarter, and it's anyone's guess their impact. "The worldwide tablet market is entering a new phase in the second half of 2012 that will undoubtedly reshape the competitive landscape" Bob O'Donnell, IDC program vice president, says. "While Apple will continue to sit comfortably on the top for now, the battle for the next several positions is going to be fierce". Big picture: "Throw in Ultrabooks, the launch of Windows 8 and a few surprise product launches, and you have all the makings of an incredible 2012 holiday shopping season". Break out your Christmas list.